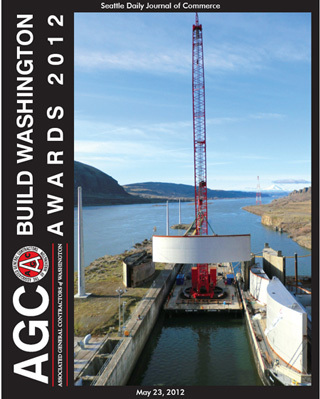 Advanced American Construction was the construction grand winner for the John Day Lock and Dam gate and sheave replacement on the Columbia River. The contractor won in the heavy/industrial category. The Associated General Contractors of Washington recognized some of the state’s most successful projects during the AGC Build Washington Awards, emceed by KIRO radio’s Dave Ross at the Seattle Sheraton on May 22. “I congratulate all the award winners for their outstanding projects and for their commitment to safety, technological innovation and community service,” said AGC President Steve Isenhart. The grand winner in construction was Advanced American Construction for the John Day Lock and Dam gate and sheave replacement. Centennial Contractors Enterprises won the grand award for safety. Lease Crutcher Lewis won the AGC-Moss Adams Service to the Community Award. Isenhart said the awards applications reflected industry trends, such as wider use of building-information modeling. The industry has also gained green-building experience and expertise, he said, and is putting safety front and center. Judges for the construction awards were Sean Comfort of AHBL, Jerry Lenzi of the Washington State Department of Transportation, Ted Ritter of Ritter Project Management, Eric Smith of the University of Washington and Olivia Yang of Washington State University. Safety award judges were John Burdick of the Port of Seattle, Adam Gerson of OSHA Region 10, Rick Gleason of the University of Washington, Eliot Lapidus of the AGC Oregon-Columbia Chapter and Sathy Rajendran of Central Washington University.